The final report of the Royal Commission into Misconduct in the Banking, Superannuation and Financial Services Industry will have to be some kind of masterpiece to meet all of the expectations on it from industry, commentators and consumers. Less regulation, more regulation, better regulation, better protection for consumers, more power to regulators, a new regulator, appropriate punishment for misconduct, restoring trust in the industry … the inquiry is being asked to cover a lot of ground, which will require it in some cases to move in opposite directions at the same time. But before the report lands, it’s worth reflecting on one of the inquiry’s key remits – namely, to identify where the behaviour and conduct of financial services companies has failed to meet “community expectations”. And where better to start assessing community expectations than with the community? 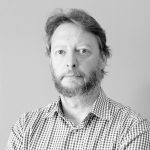 That’s what CoreData started doing at the end of 2018. Our research has found that the community expects regulators to be tougher on corporate misconduct than they have been. It expects serious misconduct by financial services executives to be punished appropriately. It clearly expects the remuneration of executives, customer-facing staff and representatives like mortgage brokers and financial advisers to be de-coupled from sales targets. And it expects that the provision of financial advice to be separated from selling products. In slightly brighter news for the industry, there’s no great community expectation that for-profit super funds should be banned, nor that poorly performing financial services businesses should be nationalised. But the community clearly believes that regulatory bodies should be granted additional powers to investigate financial services companies. More than half believe a new corporate regulator should be conjured into existence to serve this purpose. When it comes to how financial services company employees and representatives are paid for what they do, and the consequences for misconduct, community expectations are equally strongly expressed. More than three-quarters of people believe CEO and managing director salaries should be regulated, and a similar proportion believe that executives found guilty of serious misconduct should be jailed. 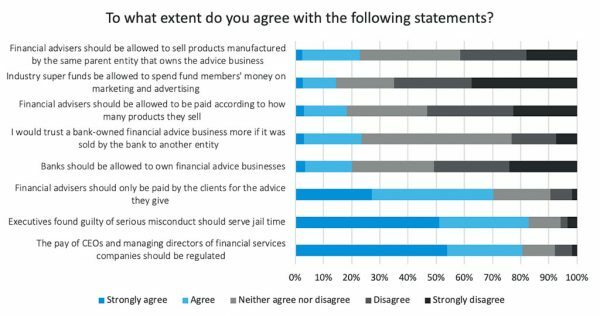 Only half of all people believe banks should be allowed to own financial services businesses, and less than a quarter say they would trust a financial advice business more if it were sold by the bank that owns it. And less than a quarter of the community thinks it’s OK that advisers sell products that are manufactured by the same entity that owns the advice business. When the inquiry’s report is released it will be closely analysed for how it balances the interests of consumers with the ongoing viability of the purveyors of financial services. Its challenge is to find a middle ground between addressing community expectations and anger over the conduct of the financial services industry and a perceived lack of accountability of its employees and representatives, and the need for an efficient industry that can innovate and deliver services and products to market cost-effectively. By about 4pm on Monday we’ll have a better idea of how well Ken Hayne and his counsels assisting have achieved that goal.